Pay attention to your surroundings during your journey from the airport to downtown Yangon (Rangoon) and you’ll see rows of colourful umbrellas and well-manicured gardens. 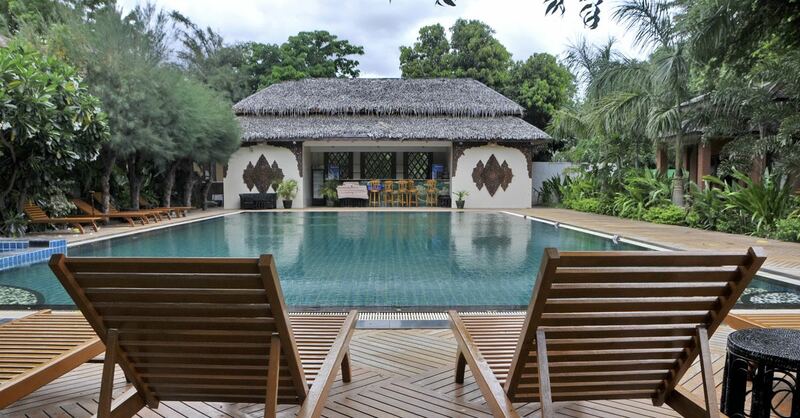 Hiding among them is Inya Lake and all that its 37 acres has to offer. 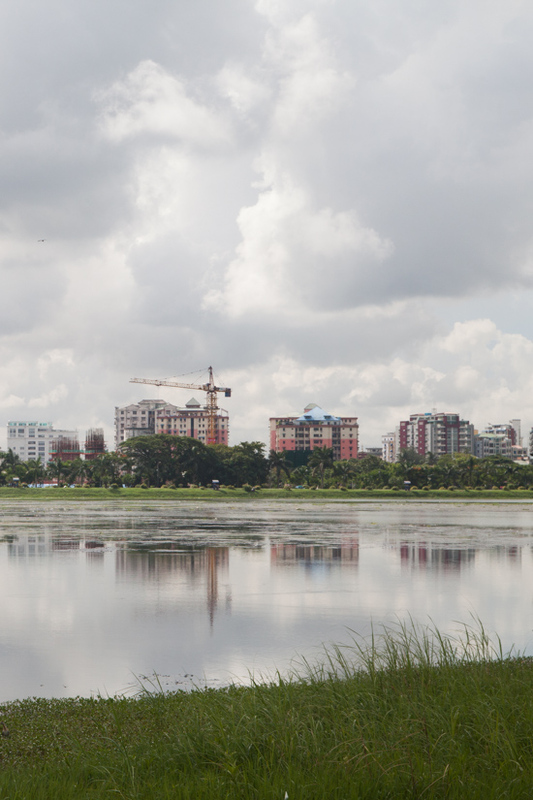 The largest lake in Yangon hosts numerous activities and restaurants and is a worthy way to spend some time away from the hustle and bustle of city life. The driving range of no return. 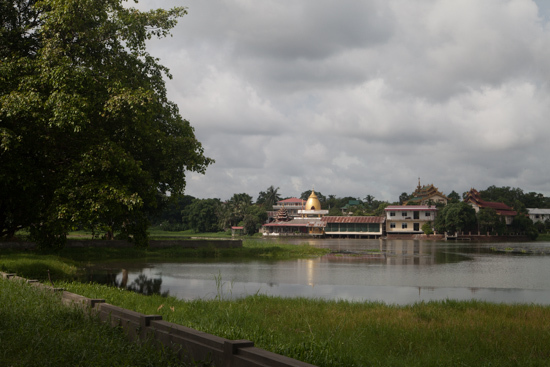 Built by the British in 1882 as a water reservoir, the lake is now home to the mansions of many of Yangon’s well-heeled elite. Along with many others who have been drawn to the calm and picturesque setting, Aung San Su Kyi spent 15 years under house arrest in her lakeside home here, while still-sanctioned crony Tay-Za has an office in the surrounds. History and development encircle Inya Lake. Despite the affluence of the area, the lake offers a pleasant day trip for a cost of nil to low. A tall and rather decrepit ferris wheel stands at the southeast corner, off Kabar Aye Pagoda Road, with a driving range to the side. While adventurous sorts have ridden the rusting hulk at their own risk and lived to tell the tale, we prefer spending our afternoons nearby in a calmer setting: hitting golf balls into the lake (50 kyat per ball) with a cold beer waiting. A walk along the shores brings picturesque scenes. After working up an appetite, you’re in an ideal place to grab dinner. 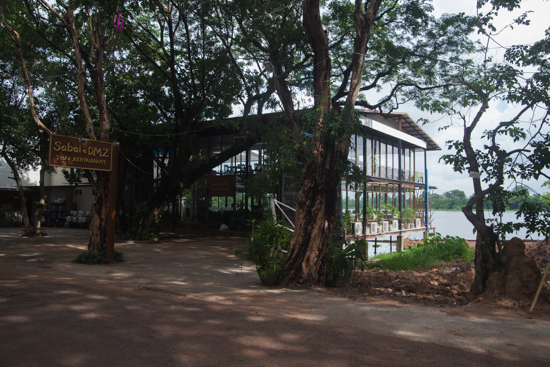 Head to the west side of the lake, on Pyay Road, which has a row of lakeside restaurants offering up local fare. Plan to share your grilled fish and rice with felines licking their chops in anticipation of some freebies and watch kayak and sailing teams race each other back and forth in the sunset. If you are looking for something a bit more upscale, high-end restaurants such as L’Opera and Sabai DMZ offer good foreign food, lake views and garden strolls. In the evenings, the park and walkways fill up with families taking in the cooler weather and university students gathering to serenade those within earshot. Sabai DMZ restaurant in all its reflective attraction. 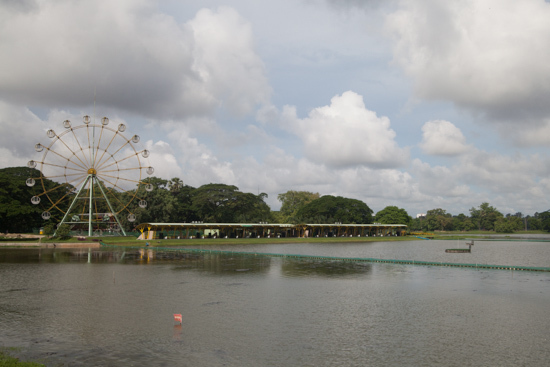 Unlike Kandawgyi Lake, there is no admission fee. Do take note that the pathway does not connect the east bank and west bank, since the north and south banks are dominated by private homes. Even though walking between the two banks is possible, it takes a good 40 minutes and is best side-stepped with a 1,500 kyat taxi ride. If you’re not so keen to hit the driving range, head straight to the west bank for the best people-watching. Inya Lake is about 10 kilometres from downtown and should cost about 3,000-4,000 kyat in a taxi. Streets bordering the lake are Parami Road to the north, Kabar Aye Pagoda Road to the east, University Avenue on the south and Pyay Road to the west.